Excellent selective focus on the bee and the circle of anthers, gorgeous colors. I'm undecided about the out-of-focus flower center - perhaps it should be more out-of-focus? About the flower head, It was about 1.5 inches long above the petals. Yes, I wondered about blurring the head at the center. I will repost if I am able to blur it. I love the colors and the way the bee’s match the stamens’. I really like the placement of the bee in the frame. I do find the central part rather distracting. Great focus on the bee, clean background, nice colors. Maybe try this concept (perspective) on another flat flower and bee, and use a smaller F to avoid out of focus flower center? Just a thought, not sure it will work. I tried several ways to reduce the prominence of oof center. nothing seems to work. It is interesting to see that the oof areas in the periphery are are less bothersome to the eye than when it is at the center. 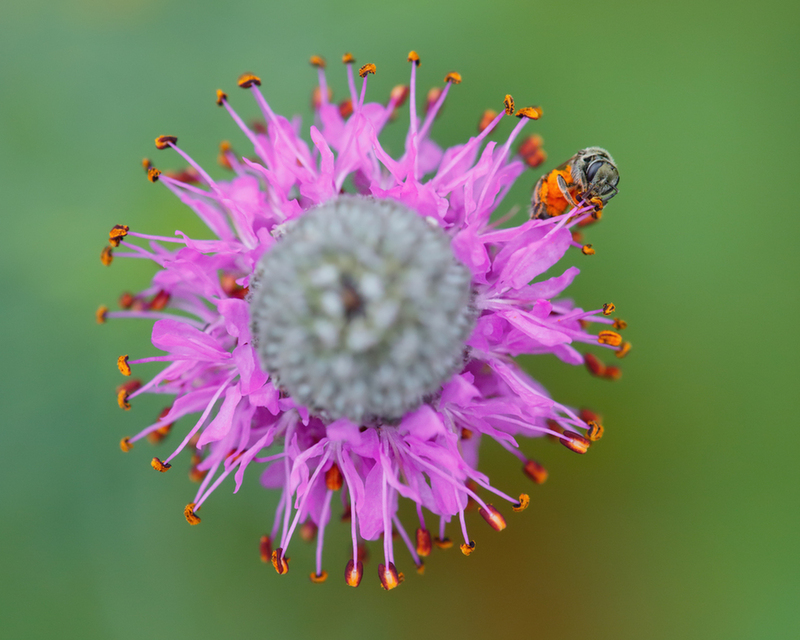 My initial thought on this image was that the petals and anthers take the eye around the periphery to the bee and then around the petals - a circular composition. I have to agree with others that when the oof area is in the center, it is rather distracting. Next time, Thanks for all the comments. A good learning experience, anyway.